When Nathan Orr first ran for the Legislature, two years ago, he tried to portray himself as a younger version of Parker Space -- which is a good thing. But soon after the 2015 primary, Nathan began to go soft. Maybe it's all those classes he's been taking on political science and feminism in college (Nathan Orr is a full-time student) that have mixed up his core values, but he has been posting a lot of weird crap on Facebook. For most conservatives, the right-to-life is a basic issue and a core value. He recently posted on Facebook that abortion was not one of those issues that "truly matter". According to Nathan, the issues that "truly matter" are "foreign policy, taxes, crime, and private business." At a time when the liberal media, liberal celebrities, and liberal activists of every stripe are engaged in the most brutal assault on a Republican President in memory, Nathan Orr went on Facebook to accuse Christians of "hate-fueled speech". What is up with Nathan Orr? "I am not a lockstep member of the Republican Party. I will not go to Trenton and simply vote the party line... People should not go into government to promote a political party or single ideology." Nathan Orr is running for the New Jersey Legislature. He is a full-time student at a local community college. He claims that his involvement in student government has prepared him for the rigors of Trenton, where Republicans must battle an entrenched Democrat majority, where negotiations are tough and victories hard won. Maybe Nathan Orr should finish his schooling, get married, settle down, start paying taxes, get involved in his community, run for local office, and get some practical experience under his belt. Then, maybe at the ripe old age of 30, he should put himself forward for higher office. Nothing beats real-life experience for understanding the needs of your community and for anchoring your core values. 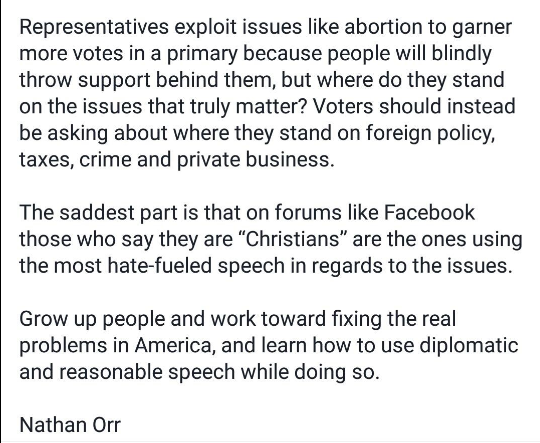 Heck, the lessons of life might even make Nathan Orr a conservative again.